Many people know Noah Lukeman as a highly successful literary agent, whose clients include winners of the Pulitzer Prize, American Book Award, Pushcart Prize and O. Henry Award as well as finalists for the Edgars, among others, AND as the author of several nonfiction books on writing, i.e. The Plot Thickens: 8 Ways to Bring Fiction to Life and The First Five Pages: A Writer's Guide to Staying Out of the Rejection Pile. 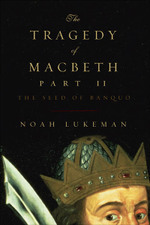 But in October, Pegasus will publish a play by Lukeman titled The Tragedy of Macbeth, Part II: The Seed of Banquo. Not only does it pick up where Shakespeare's Macbeth left off, imagining a resolution to the witches' original prophecy that "the seed of Banquo" will become kings, but it's written in blank verse, adhering to the traditional Shakespearean five-act structure and executed in the form of what would be a faithful sequel. After recently attending performances of the Folger Theater's production by Aaron Posner and Teller (of Penn and Teller), I have to admit my appetite is whetted for such a "novel" idea for a play. Although not crime fiction-related, in other publshing news, self-pubbed authors around the globe can take a little bit of satisfaction from the knowledge that the PEN/Ackerley Shortlist in the U.K. includes a self-published title for the first time, the memoir Who Is It That Can Tell Me Who I Am? by Jane Haynes (the Guardian describes it as "an unflinching journal" of her life as a psychotherapist"). The other finalists in the memoir/autobiography category are The Islamist by Ed Husain, In My Father's House by Miranda Seymour, The Presence by Dannie Abse and Family Romance by John Lanchester. The winner will be announced on June 10.